Hello Friends! I am a day behind on my posts, but I'm determined to stick with this challenge. I actually did my coloring yesterday, on Day 18, I just didn't have time to post it. Life goes on. I'm trying not to be so hard on myself, but I'm a little OCD. *sigh* Short post today, okay? I've got a 2 hour drive ahead of me and I haven't packed yet. Here is my cast of characters. 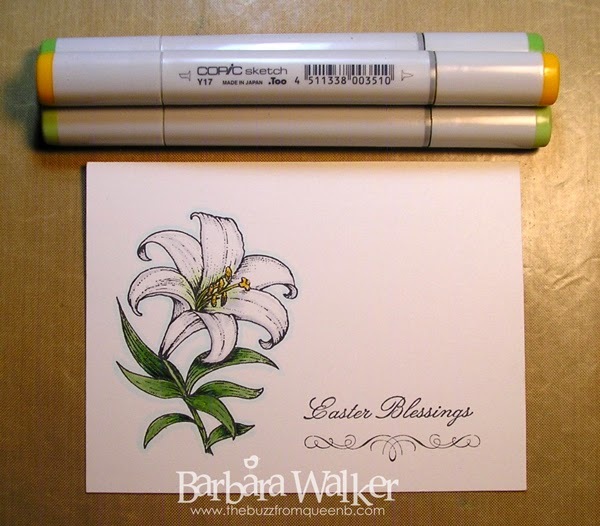 My brother requested a few Easter cards, so I thought I would pull out my Easter Lily set. It's from Flourishes, which sadly is no longer in business. BUT...Marcella Hawley is still sharing her gorgeous illustrations in her online shop Power Poppy. Refer to my previous post to see one of her lovely digital stamps. 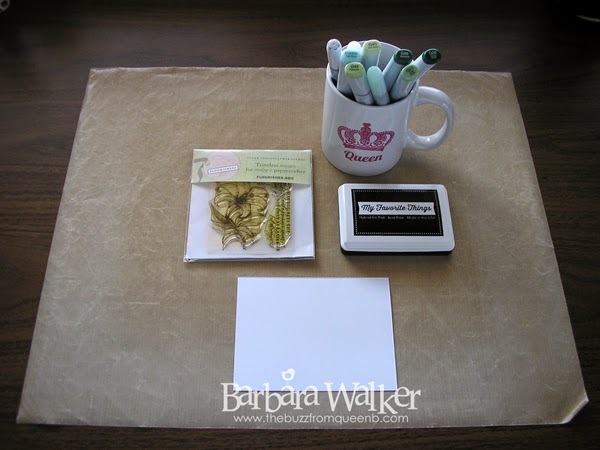 I stamped my image onto smooth white card stock using My Favorite Things Black Licorice Hybrid ink. I Googled Easter Lily to get a fresh perspective on the flower and I discovered that there is a bit of green in the throat of the bloom. So, that is how I chose to color mine. So, it was 10:30 pm when I began coloring this beauty. And it took me about 15 minutes to color it. That is the beauty of the challenge; just try and carve out a tiny bit of time each day to color. I hope I can keep up this practice even after the challenge is over. I am enjoying coloring and sharing what I've colored with all of you, even though it's not in the form of a finished card. Because honestly, sometimes, I'm not in the mood to make a card, but I want to color something. Simple coloring on this of course, however, if you click the photo, you will see that I used a light gray marker on each of the lily petals. I spent a little time with the leaves, because I wanted them to have a reflective quality and not just appear one shade of green. And for my dear sweet friend, Patti, here are the shades of green I used on this image: G21, G24 and G28. I start with my darkest color and then feather in the other shades. I like coloring this way, as I get a better blend and I use less ink. I know there are other Copic coloring methods, but this is what works for me. After I finished all of my coloring, I outlined the image with a pale blue marker. And that was that! Thank you so much for visiting. Have a wonderful Sunday. Beautiful, Barb! I hope you have a safe trip. I'm truly inspired by your ability to post even though it may be late and you are tired after a long day. That is dedication! It seems as though you are also deriving a lot of satisfaction from the coloring as well. Keep it up, if you can, but please don't feel bad if prevents you from coloring! Hugs!! Just wanted to let you know how much I look forward to when your email arrives in my inbox! Each time I learn a little(sometimes a lot!) of new techniques. Each step explained clearly and always lending an air of "you can do this too!" thanks again.